We are so excited to finally be sharing our Craft Studio that we finished last month. We completed this makeover in about 36 hours! In case you haven’t heard, I (Mallory) will finally be moving back to Arizona (15 minutes from Savannah!!!) and we wanted a space that we could lock ourselves in and bust out some major projects, blog work and brainstorming in the few hours a week we will have to work together. Aside from blogging, we each have our own “side jobs”. I run an Etsy shop selling vinyl designs for home decor and Savannah is a hair stylist (a dang good one at that! *winks*). Between our jobs, being wives and having 7 kiddos under 6 between the two of us, we have to prioritize, plan and bust out projects whenever there is an opportunity. We had a 36 hour window before flying to a conference in Salt Lake City so we busted it out! 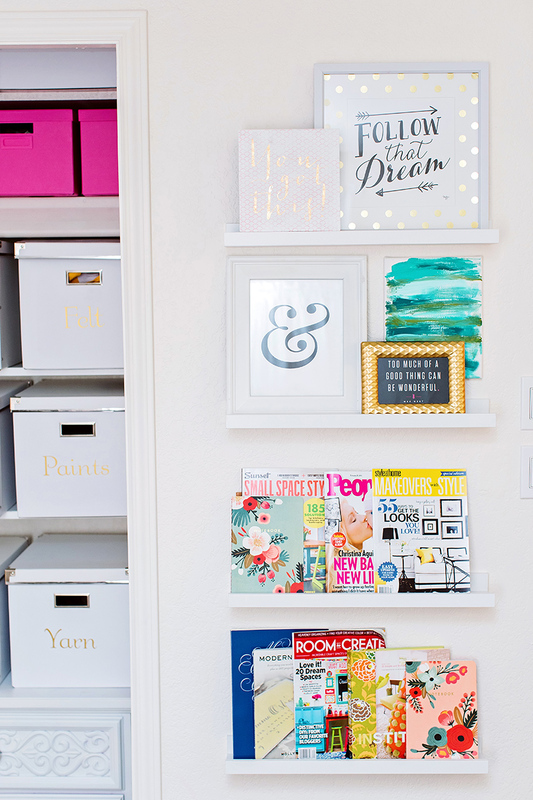 The need for a workspace is long overdue and we are thrilled with how this one turned out. We’ve converted one of Savannah’s bedrooms into a studio space for us to work, craft, brainstorm and a place to keep our supplies organized. 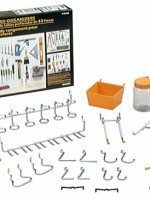 For now, it is all of Savannah’s crafting supplies in the storage boxes and bookshelves but when I move to Arizona, we will have access to both of our stock pile of crafting supplies, tools, paint and decor items. 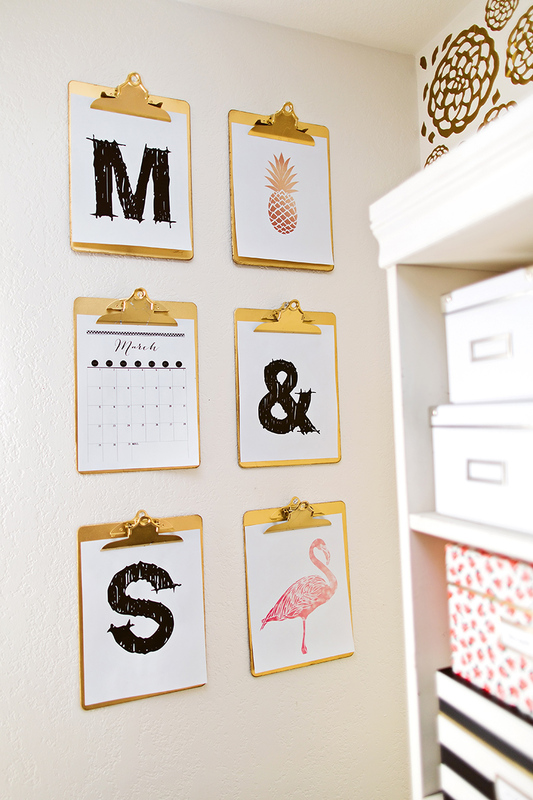 The clipboards here are a super easy DIY project. We bought clipboards from Amazon here* (*affiliate links) and spray painted them with our favorite spray paint, RustOleum gold metallic spray paint*. 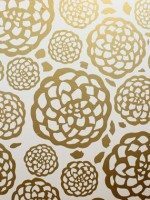 The floral wall decals are available here in my Etsy Shop. The bookcases were thrift store finds that Savannah found a few years ago. We painted them years ago and they were perfect for this space, don’t you think? 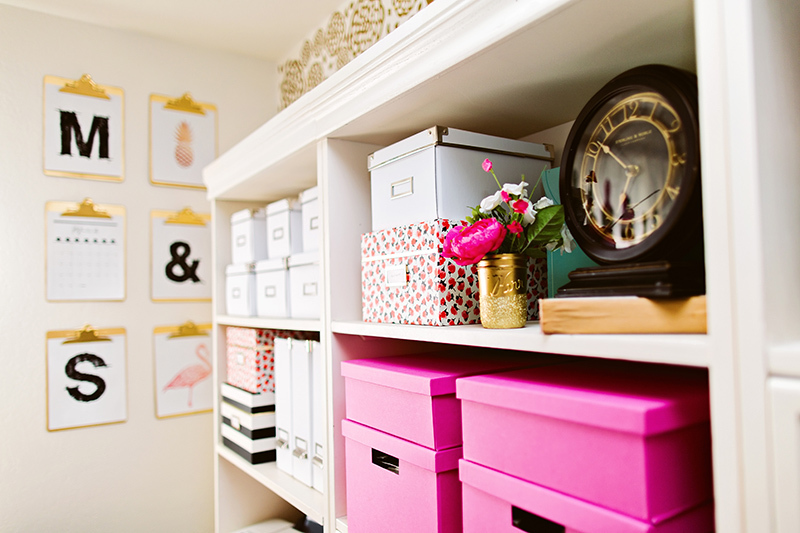 We used Ikea storage boxes* and Kate Spade storage boxes* to organize all of the craft supplies, in the room. It’s shocking how much we were able to fit in the room after putting everything (with like items) in the boxes and drawers. Organizing makes me giddy. Can you tell? 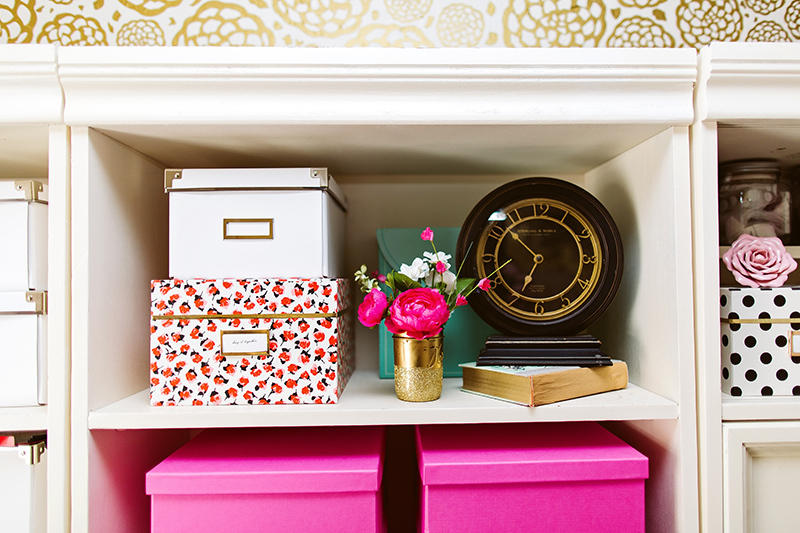 All of the solid colored boxes are from Ikea and the printed boxes (floral, striped, polka dot) are Kate Spade. They’re just too good not to splurge on. We completely emptied out the closet, added shelves and the pegboard. Oh, the pegboard. 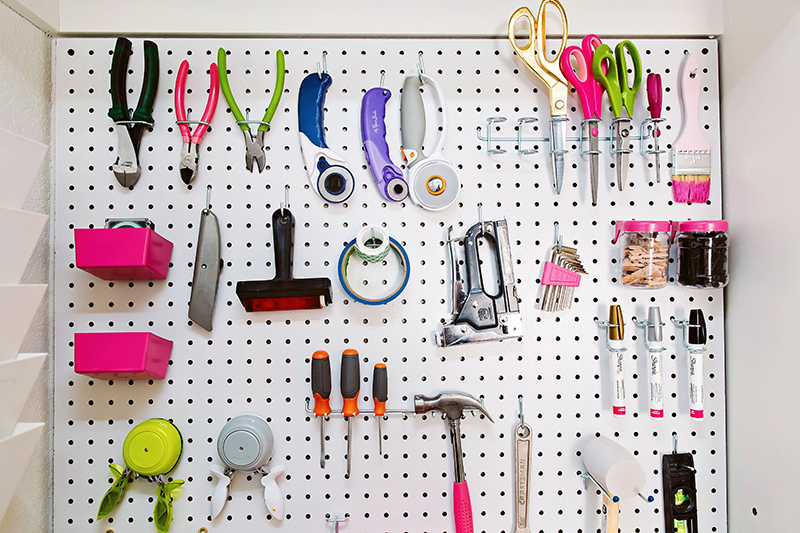 The easiest way to organize your handheld tools, you guys. I mean, let’s not reinvent the wheel when the pegboard works wonders. 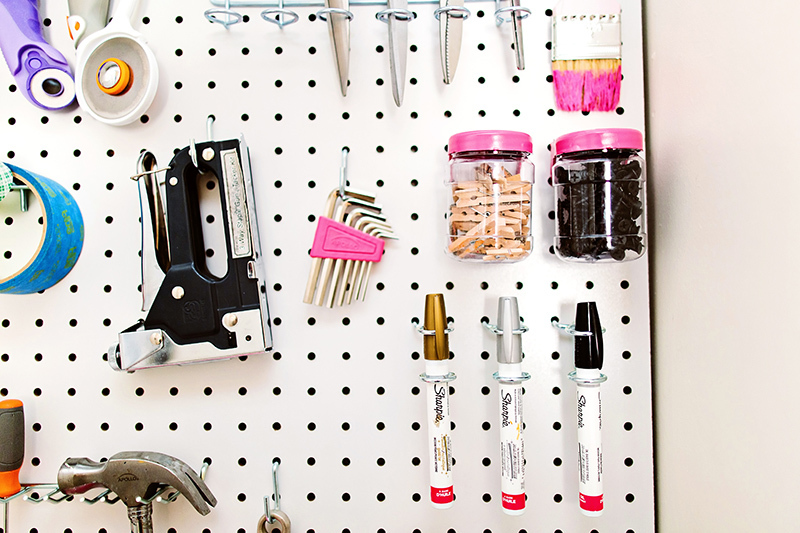 We bought the pegboard at Home Depot, had it cut to size and ordered these pegboard accessories* from Amazon to complete the space. Ours were navy and we sprayed them pink. Shocking, I know. I made the labels with my Silhouette CAMEO* in the Bauderie Script font. 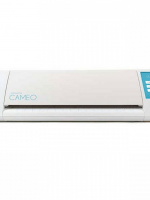 It’s the perfect font for labels. Pretty, dainty and readable. 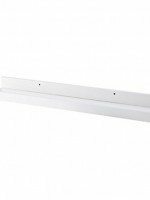 These cute little shelves are from Ikea. You can get similar* (or maybe these exact ones??) here. Could you die at the mini-marquee sign? It was fun to put our handle and a fun hashtag on it. 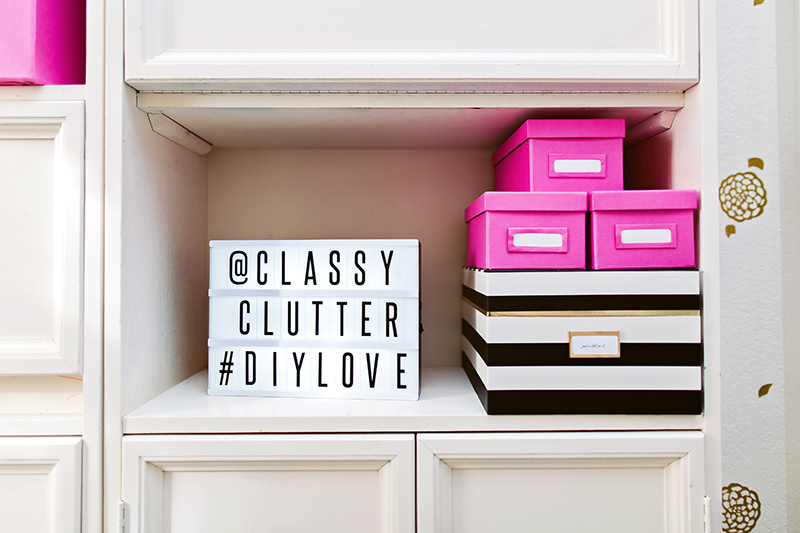 Follow us @classyclutter on instagram! 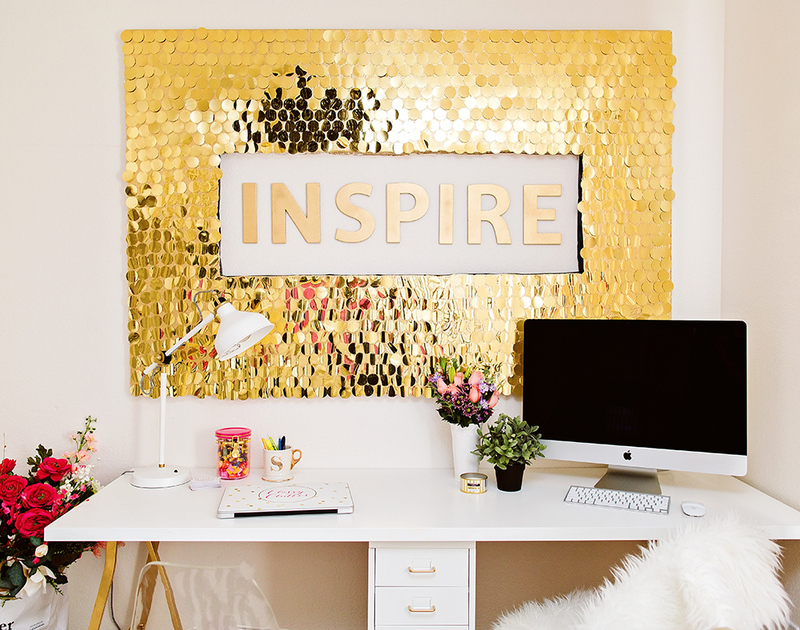 Check out the tutorial for our sequins INSPIRE wall art here. The desk, lamp, drawers beneath the desk are all from Ikea. The fur rug is from HomeGoods. 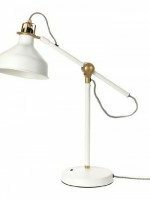 We’re obsessed with the lamp and you can even get it on Amazon here* if you don’t live near Ikea. Don’t mind our little candy stash. You’ve GOT to have candy stash when you’re working on projects. Am I right or am I right? Later this week we will have the DIY Paint Brush Statement Art piece that is hanging in front of the window. Isn’t it cool?? 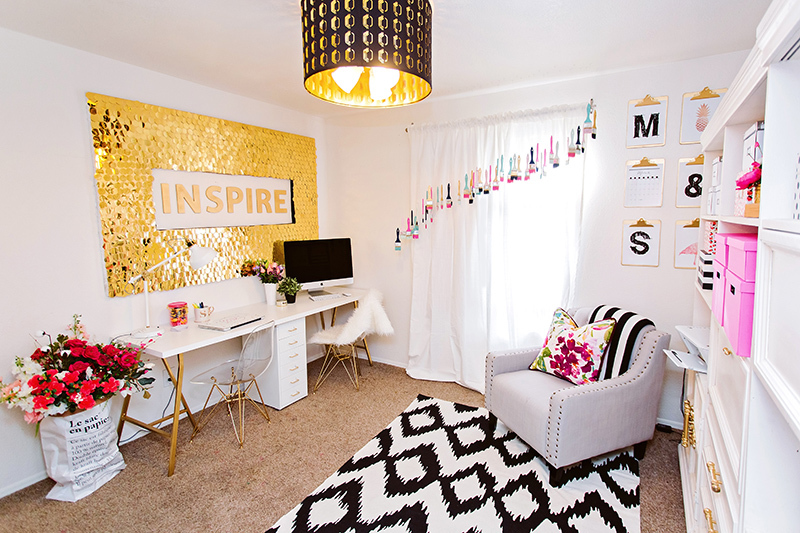 Oh, the rug is from Hobby Lobby, Black/gold (it was black/copper but we spray painted it) drum shade is from Ikea. For the light, we just took the fan blades off and mounted the shade right over the existing light fixture. Super easy! 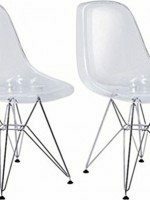 The acrylic chairs are from Amazon too*. You can get them here, we spray painted the bases gold as well. We hope you love our space and hope you do too! If we forgot to list where an item is from, shoot us a comment or an email and we’ll answer that for you! Happy crafting friends! You girls do an AWESOME job putting it all together and have FUN at the same time! 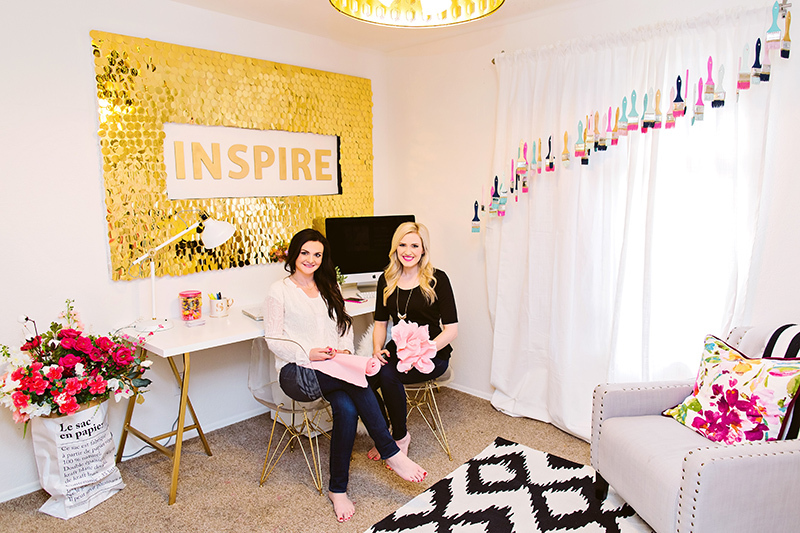 I LOVE LOVE decorating my home and you two are an inspiration to me! Thanks for sharing! PS I’m a Mary Kay consultant so if you don’t have a consultant, check out my website for the BEST color cosmetics and skincare out there! Our new Spring colors are so fun!! Inspiring creative space! Very organized, light and beautiful. Enjoy your new office, make great things! Absolutely love this space! So bright and fun! 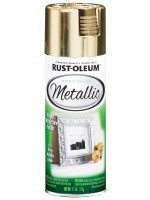 I adore that y’all will spray-paint anything gold that you think needs it–I am one of those who’s always thinking, “Gold? Yes, definitely.” But then I lose my nerve. You can’t argue with the results here, though. So glam, so bright, so gorgeous. Long may you enjoy and be inspired. 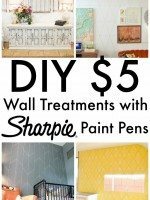 Have you covered the paintbrush-stenciled curtain in a previous post? I’m loving that too. Oh, and the throw pillow on your beautiful nailhead trim side chair–that fabric! I need it for reasons! Thanks so much for your kind words! 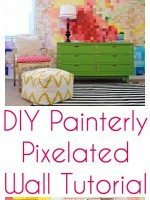 The paintbrush art tutorial will be shared on Thursday and the fabric from the throw pillow is from Tonic Living I believe. Amazing job ladies, just amazing! I absolutley love it! I am in love with all your crafts and decoration. Yesterday I was late seeing all your post as I had just discovered… THANKS for all your ideas and work..
Love it all! 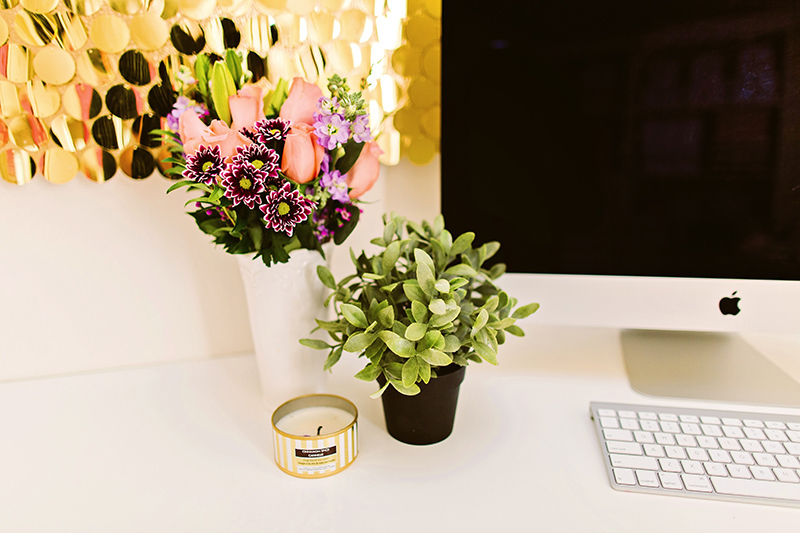 Wondering where you got the floral decor pillow and the floral arrangements on your desk?!?!?! The floral pillow was a custom design from our friend at KB Cute on Etsy. We supplied her with fabric from Tonic Living. Hope that helps! Wowza! This is lovely! You ladies did a fantastic job and in such a short amount of time! Amazing! I’m so in love with this room!!! 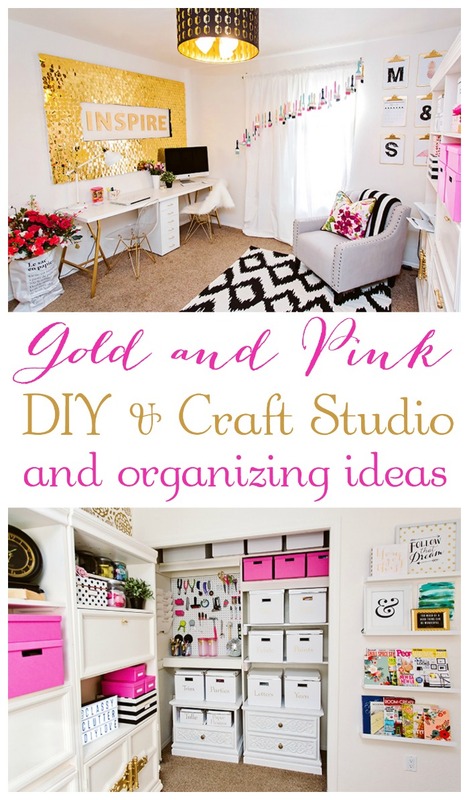 I want a craft studio just like it. Where did you get the “Follow that Dream” framed print? What model of desk from Ikea is it? Did you put two desk together or is it one? Gorgeous!! Where are the floral pillow and striped throw from? 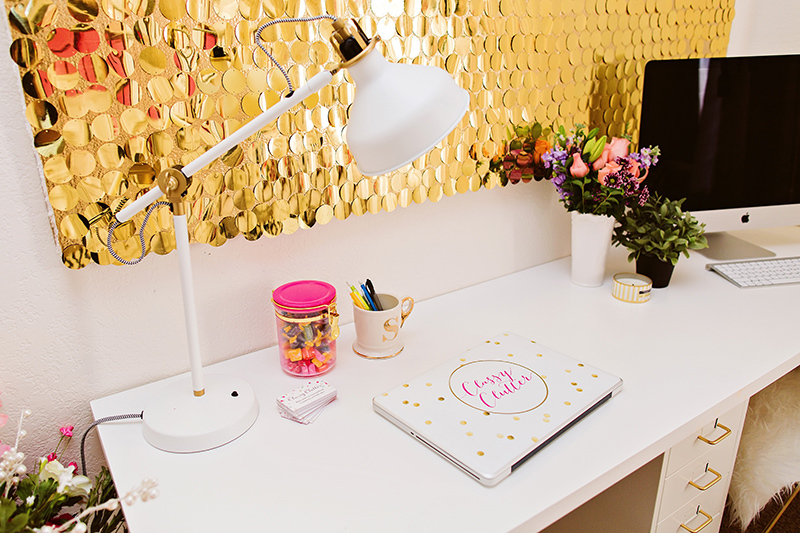 I’m obsessed with your desk. Can you give more details about it? Stunning room ladies! I just started boxing the clusters in my open shelves and it make for so much more room (and less eye-overload)! I second the above commenter: where’d you get that darling mini marquee sign?? Was it an earlier DIY? I must know! Great room! Love all the details! Where is the mini-marquee sign from? Where is the floral throw pillow from? I can’t find it anywhere. I bought the pillow at home goods! 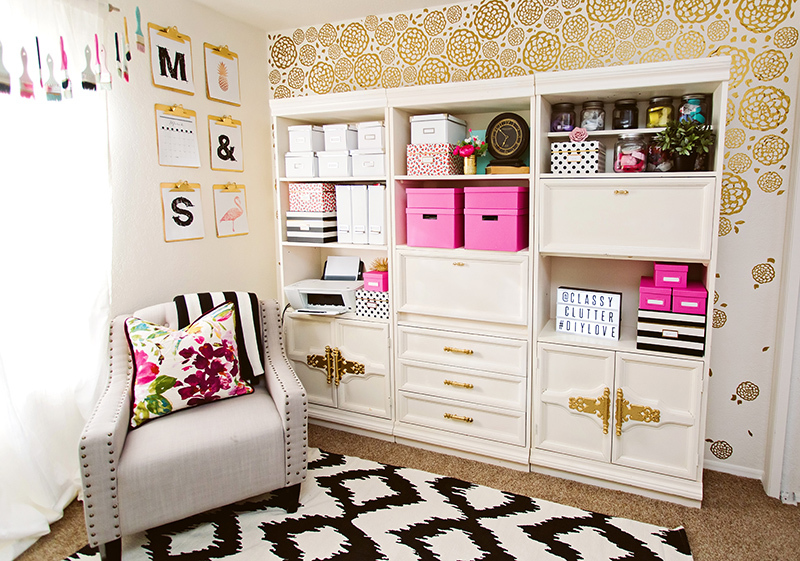 Excuse me while I clean the drool off of my keyboard… I love EVERYTHING about this room! So beautiful! Absolutely adore this room. I tried making the clipboards and they aren’t shiny like the ones in the picture. I bought the same clipboards and spray paint. Am I missing something, how do I get them to be shiny?